For the rest of you, perhaps you'd prefer celebrating "Happy Buy Nothing Day". I am sure it is the more wholesome way to go, for both body and soul. It is a fine thing to eat together in a festive manner and to celebrate what we have received by way of bodily sustenance and each other. Cultures have been celebrating the harvest since before written history. Whatever your mode of celebration is, I hope it is plenteous and enjoyable! 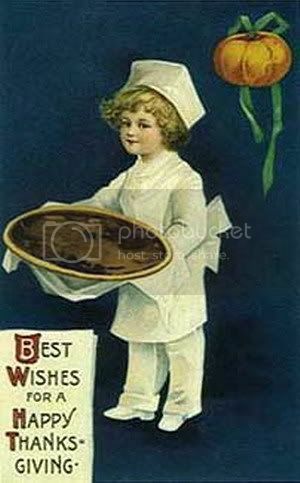 Happy day to you too, and best wishes on being hostess--not an easy job. Good luck with the hostess duties! Is your daugther home for the holidays? I bet you can guess where *my* most recent impression of Thanksgiving family revels comes from (points to icon). I hope your celebration will be the polar opposite of those two's! That is so funny, Maeglian! After weeks of not listening to it I listened to the BBM soundtrack yesterday. Today while Glen (my husband) was making the fire I thought, "Hey! I want to watch BBM - it's even got [hilarious/heartbreaking] Thanksgiving scenes!" If I am not too tired after the clean-up, I'll do just that. Thanks for the greetings, Maeglian. I have missed you. Happy Thanksgiving! I hope your meal went without a hitch. Here, it's just another day. However, I've just returned from the Company's "sundowner". This is a once a month occurrence, where staff in the Company's social club go to a hotel for drinks after works on the last Friday of the month. We contribute $2 a week towards this, and we get free drinks and snacks (mini spring rolls, sushi rolls, etc). Since I don't drink alcohol, I usually have "mocktails" (blended fruit, which includes strawberries, kiwi fruit, passionfruit, etc). Delicious. Mmmmm.... Spring rolls.... Sushi.... Blended fruity drinks (you mean like smoothies? even bigger yum). Yes, the dinner went fine. I'll be doing a bit more clean-up this morning. Yes, they're like smoothies, only the base is fruit juice, rather than milk. It seems almost every time I get one, it's different to any others I've had. Each individual bar person has their own recipe, so it's always a surprise when it's served to you! Sometimes there are whole strawberries in the glass, but it's impossible to get them out, because they don't provide a spoon, and even though I can stab it with a plastic straw, it's not strong enough to slide up the inside of the glass! You'll just have to use your fingers on those strawberries. Maybe they'd provide a spoon if asked? P.S. I finally looked at the garden sections on Frodo's Mum's website. Heavens! I see what you mean. Absolutely gorgeous! It looks like an English estate. But perhaps their actual home is modest and she's just a very gifted, ambitious gardener who lives in the country amid farms. They must (live among farms), with those sheep next door. These drinks are served in a tall, narrow glass, so I can't reach the fruit at the bottom with my fingers. Anyway, today's drink had a strawberry sliced and sitting on the edge of the glass. It was sweet! I'm very impressed with her garden. I'd love to have half the plants she'd got (and the time to tend them)! Yes, I'd say it was definitely in a country area, especially since she has enough grass to mow that will take 8 hours with a hand mower, or 3 1/2 hours with a ride-on mower! That was me. *??? * I wasn't expecting to be logged out! Erm....I think the US is the only country that celebrates this Holiday, well, on this day anyway...Canada does the Big-Dinner-with-Pumpkin-Pie thing earlier in October, but as far as I know, this is an exclusively North American Holiday !!! .did you know that it used to be on the last Thursday of November, rather than the third, and got moved during the War to boost the economy before Christmas ? Yes, I knew Canada's was in October. I suppose I should have been more specific that I meant "holidays of thanksgiving" and not a celebration of what the pilgrims did in the Massachusetts Bay Colony, lol.